Do not let your questions on gate repairs stay unanswered, read on for answers. Why automatic roll up gates need frequent inspection? All automatic systems must be checked often since the smallest problem with any of their parts could lead to accidents. Gate Repair Manhattan reminds you that there's a reason why all automatic rolling gates have sensors. Frequent inspections will solve problems and ensure safety. What's the advantage of choosing gate keypads? Gate opener keypads allow you to enter the property by just entering a password. Depending on how many access codes you'll need, you'll choose the right keypad system. Some systems facilitate the entrance of hundreds of tenants and you still have temporary codes for visitors. Is it necessary to keep replacement parts? If you want to provide fast troubleshooting you can keep some spare parts. The most important ones are batteries, spring, belts, loop detector, photo eye and control board. If this option seems too costly for you or if you feel that you cannot fix a problem by yourself, you do not have to do it. Why must sensors reverse the gate? 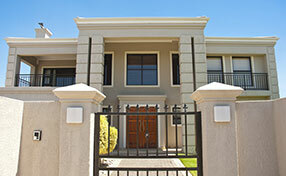 Residential gate opener sensors must stop the gate and, in addition, reverse it for safety reasons. If someone is entrapped, injuries are not completely avoidable if the gate simply stops. It must reverse for at least 2 inches so one can be freed. What are the recommended top arm type openers? There are many brands of top arm type gate openers. 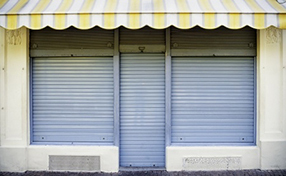 Our experts in gate repair and maintenance, based on experience, recommend Ramset, Eagle, and Elite openers. These gate operators are reliable enough not to require frequent automatic gate troubleshooting. The top arm gate opener from these brands are some of the best in the industry. What is a chain tensioner? 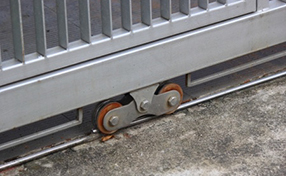 These are hardware components which are found in practically all automatic sliding gates. There is usually one tensioner on each side of the chain. The most basic design of this component includes a bolt and two nuts. The tensioners are used for adjusting the tension of the chain, as their name suggests. It can be reduced or increased, depending on whether the component is too tight or too loose.